Just over two months until THE COLLECTORS arrives. The final weeks of book gestation are some of the weirdest and longest. It’s less like having a baby than laying an egg (I imagine): You’ve done all the work, and then you just have to sit there and worry and try not to lose your mind, and then, FINALLY, out hatches this thing that only sort of feels like yours, because it’s been outside of you for so long. Now it belongs to itself. And to readers. I’m planning to host a special giveaway of my own via Instagram in the near future, so if you’re not already following me there — jacqueline.west.writes — you might want to change that. Finally, some big big news: My next YA novel, a modern-day Minnesotan retelling of the guitarist-selling-his-soul-to-the-devil legend, is coming next summer. 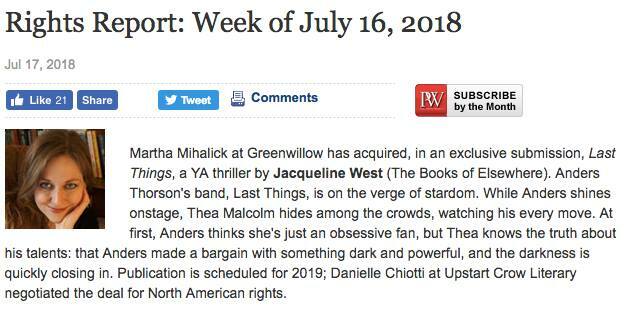 It’s going to be called LAST THINGS, and honestly, I have never been more excited about anything that I’ve written.